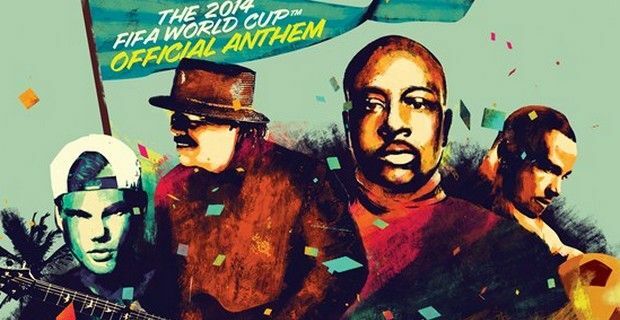 The legendary Carlos Santana, multi-Grammy Award winner Wyclef Jean, Swedish DJ Avicii (who is currently recovering from gall bladder surgery) and Brazilian Latin Grammy winner Alexandre Pires will be performing "Dar um Jeito” (We Will Find A Way) in the closing ceremony of the 2014 FIFA World Cup. "Dar um Jeito (We Will Find A Way)" will be performed at on July 13 at the Maracana Stadium in Rio de Janeiro. In Portuguese, Dar Um Jeito “means to find a way around obstacles and impossibilities” according to the track’s writer Ash Pournouri, a two-time Grammy-nominee. The track was recorded at PRMD Studios in Stockholm earlier this year with, Santana, Pires and Avicii each adding their own sound to the recording. The track will be released later this month. "It is an honor to take part in the 2014 FIFA World Cup and have "Dar um Jeito (We Will Find A Way)" selected as the Anthem. Along with my brothers, Wyclef, Avicii and Alexandre Pires, we look forward to performing the song in Rio de Janeiro in July and sharing this message of light and hope on the FIFA World Cup stage," said Carlos Santana. Wyclef Jean, who is currently working on his forthcoming record with Avicii, ‘Wyclef Jean: Untitled’, said of the anthem, "Despite the fact that I was born in a place where darkness at times steals the sunshine, where rain often turns to floods and children often cannot be found, I have always found a way to sing with joy.... "Dar um Jeito" is dedicated to all those searching for the light… knowing that they too, shall soon find a way." “To write for the official closing anthem of the FIFA World Cup is a huge honour as it's the biggest event I can remember growing up. I gave it a 'Samba meets my dance music' sound which works perfectly for the positive spirit of the song," added Avicii. The opening ceremony at the Arena de Sao Paulo on June 12 will see Pitbull with Jennifer Lopez and Brazilian singer Claudia Leitte perform the official World Cup song "We Are One (Ole Ola)".